In order for any company to succeed the entire organization must be empowered to do their part on a daily basis. In order for all employee to consistently perform to the level expected by our customers, we must provide each person with the tools they need to fully understand and excel in their position.Providing employees with these necessary tools means training. In order for a group of people, with different backgrounds and interests, to become a fully functioning team, the entire team must develop a common understanding of their functions and the products and services that they are providing to our customers. 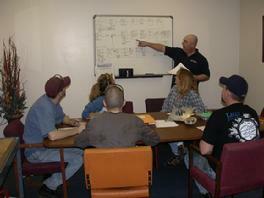 At Appalachian Cast Products, we believe that in order to succeed our employees must be truly a part of the team. They are the most important asset that we have and without their input and cooperation we cannot fully achieve our goals. Our management team has extensive experience in the development and execution of training programs specific to our business. We have developed and trained programs in all aspects of the die casting business, from process specific classes and quality systems training to blue print reading and machine hydraulics. Employee Knowledge is the Key! Our quality philosophy at ACP is to provide the proper training to our employees, and the proper tools needed and held to a high level of accountability and ownership for every product related activity.